TeraCopy Free Download Latest Version For Windows OS (XP-7-8 and 10). Get the offline installer standalone setup file of TeraCopy with a single, direct and secure link. The downloaded setup file is compatible with both Windows 32 and 64-bit versions. TeraCopy is a powerful utility that lets you copy, move and test the integrity of your files faster and more securely. Copy and move your files and folders on Windows faster than usual. It improves the Windows Copy/Move feature and adds an extra functions like checksum calculation and permanent delete! TeraCopy 2018 is a powerful program that has been designed to speed up and secure file copy and transfer process. The software provides a quick and efficient way to copy a file or folder from a location through quick and intuitive actions. The main function of TeraCopy is to copy and transfer files at the maximum possible speed, and it gives you full details about the files that are being processed. TeraCopy Pro is a very reliable software for copy and move operations, thus it reduces the waiting time and increases the speed of copy and transfer speed. You can also resume the transfer process of broken files at any time, it also supports automatic file verification. You may also like FileZilla. TeraCopy allows you to copy and move files on Windows much faster than usual. Contrary to what happens with standard Windows copy and move options, TeraCopy is able to resume interrupted transfers, avoid or report files that are corrupted without having to wait for the copy to finish, or calculate the CRC verification codes to verify the integrity of the data. Buffers that adjust dynamically reduce the search time when transferring files between two physical disk drives. Once installed, TeraCopy is integrated into the context menu of the Windows Explorer (right mouse button) and can be set as the system's default copy tool. 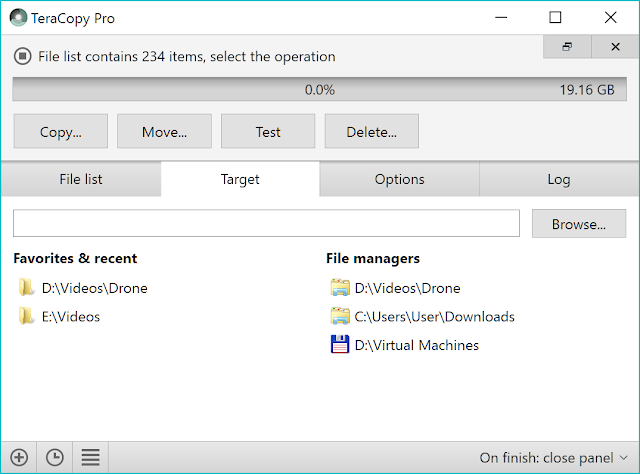 TeraCopy is an alternative to Windows file manager that will allow you to improve the efficiency when copying or moving a large number of files. Specifically, with TeraCopy you can test the integrity of the files before copying or moving them, increasing the size of the buffer and accelerating, consequently, the transfer rate and displaying a series of reports after each action. Its use is very simple. You just have to select the files you want to copy, display the Windows context menu (right button) and execute the corresponding option. TeraCopy is a great tool for copying files and folders very quickly, saving a lot of time and transferring all types of files from audio, video, pictures, documents and folders from the computer to all types of external storage devices and vice versa. The program supports computer users both beginners and professionals. All you have to do is select the file to be copied and then press the right mouse button and choose the icon transfer by TeraCopy. TeraCopy helps you also to recover damaged files. If the files are not recoverable, the program will skip them during the copying process. In addition, you can remove not important files and folders to reduce the copying time. The program uses advanced algorithms to verify the files after they are copied to make sure they are identical by comparing the fragmentation of the copied files with the files before they are copied. It supports drag and drop feature, which makes it easy to use the program. You can resume file transfer if the copy is interrupted for any reason. TeraCopy is a fast and easy solution for transferring large files and games at high speed. The program saves all the data related to the folder and uploaded files and records the time and date of copying the files. Ease to free system resources. Pause and resume file transfer. Shell integration in Windows Explorer. Increase the file transfer speed between the disks. Compatible with all types of binary files. Unicode full support, and many more. 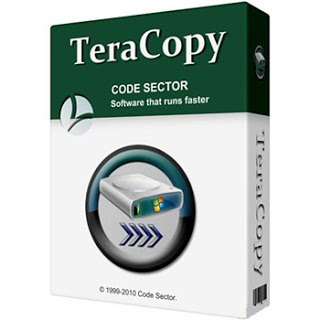 Software Name: TeraCopy Utility Free Download. Click on the button below in order to download TeraCopy for PC. It's a complete offline installer and standalone setup for TeraCopy. This file would be compatible with both 32 and 64-bit windows.